Eddie McCloskey is a survivor. But the scars from his last big case run deep, slowly driving him mad. Detective Sumiko Christie has her work cut out for her. Before the two victims died, they both reported seeing a ghost. And it gets stranger. Both victims died from fear. Christie is no expert in the paranormal. Eddie isn’t ready for a case this dangerous. But they have no choice. The ghost they’re trying to find is the rarest of the rare. And it’s going to kill more people. Unless Eddie and Christie can stop it. 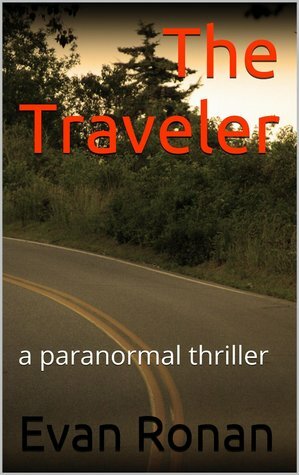 The Traveler is the fifth entry in Evan Ronan’s The Unearthed paranormal thriller series. It is approximately 85,000 words long. This series just keeps getting better and better! This one felt more like the first in the series, which was my favorite. Eddie is still the best and I am still loving him. Eddie is asked to be a consult on a case where police believe a ghost is scaring people to death. He is partnered with the very pretty Detective Christie. They work together to figure out this strange case. While Eddie is being plagued with nightmares about what happened in Oregon. Will he be able to stop the hauntings before him or anyone else he cares about is attacked by the angry ghost. I love how Eddie has been maturing more and more in each book. Even his choice in women has matured, and he wanted to be in a long term relationship instead of just a one time thing. I think him and Sumiko made an amazing couple. I'm pretty sure I squealed when they finally kissed. I mean come on, how could you not want Eddie? The thought of an angry ghost that is powerful enough to kill people is absolutely terrifying! Evan Ronan did another good job creating something that is scary to think about. The description of the ghost was great, it really painted a picture. It was definitely not a ghost I would want to run into - I don't think there is a ghost I would actually want to see though. I can't wait to read the next book in The Unearthed series. This is one of my favorite paranormal series' and I highly recommend it to everyone.